Discover our full range of clock oscillator products here and use our product search to find the exact oscillator you need. Our highlighted key clock oscillator products are chosen for their combination of highly competitive commercial pricing and large range of developed frequencies and specifications. For more information on our key product range you can contact our expert advisers here. 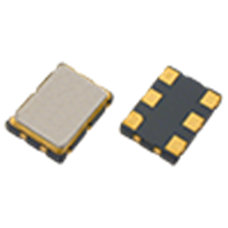 The 5.0V GXO-7551 oscillator features tight frequency stability options over automotive -40 to +85°C temperature range, in addition to fast rise/fall time and optional enable/disable functionality with power saving. The 2.5V GXO-L72J features excellent phase jitter performance of just 0.3ps typical, and produces LVDS output. This oscillator also has power saving with stand-by current of only 30µA.